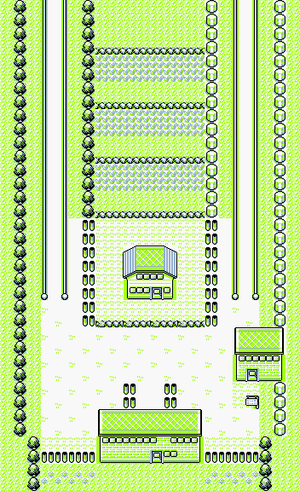 After your visit with Bill, return to Cerulean City and go to the house in the northeast corner. Walk through the backyard to find a path leading to Route 5. 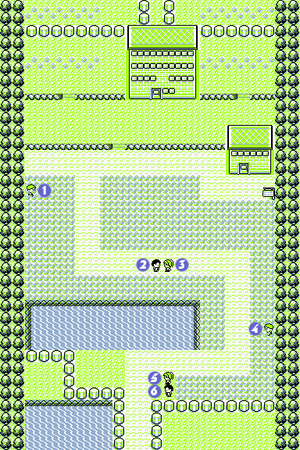 The road that goes through Saffron City is closed, but you can take the detour along the Underground Path. Stop off at the Pokémon Daycare before you head underground. You'll need to jump down the ledges from Cerulean City if you want to get to the Day Care Center, where you can drop off Pokémon to be leveled up while you walk (they gain EXP at the rate of 1 point for each step you take). Unfortunately, the head of the Center makes all the decisions, so if your Pokémon is full on skills, he may delete a skill you like or abandon the new one altogether, so be cautious. But if you bought that Magikarp back at the Mt. Moon Pokémon Center, dump it here and return later for a Gyarados. You will be charged 100 for each level gained, though. The northern gate to Saffron City is closed, so you'll have to take the underground tunnel. Access the tunnel through the building along the right side of the route. Press the button rapidly as you walk to pick up some randomly-placed items (nothing too exciting but the X Special and Full Restore could be useful later on). The Full Restore is exactly 2 squares West of the stairs at the North end of the path. The X Special is exactly 2 squares East and 6 squares North of the stairs at the South end of the path. At the Route 5 entrance, a woman will offer to trade you a male Nidoran for a female in Blue or Red, or a Cubone for a Machoke in Yellow. Not a great deal in Blue, in which female Nidorans are more common anyway, but Red players should take this opportunity for a rare Pokémon. Also, since Machoke evolves through trade, trading away your Cubone is the only way to get Machamp without a game link cable. You may not have the Pokémon that she wants, but not to worry. No matter how long it takes you to find the proper Pokémon, you can bring her the requested Pokémon any time you want. After you hand over one of your Pokémon to the Pokémon Daycare, it will get one experience point for every step you take as continue on your long adventure. Check in one of your Pokémon that you would like to have gain experience this way, rather than by using it in battles. The weak Magikarp might be a great candidate, since it becomes a ferocious Gyarados at level 20. Abra could be another good choice, since it becomes much more powerful after level 16, when it evolves to Kadabra. Even if you're gone such a long time that the Pokémon level passes up its evolution level, the Pokémon will wait for you to return and tell it whether to evolve. It will have learned any new moves that its level would have allowed. The only caveat is that in the rare instance where a Pokemon must evolve to learn a move, leaving it in the Daycare, where it doesn't evolve, may cause you to miss that chance. For instance, be sure to take an Abra out before it gets to level 16: an Abra which doesn't evolve at level 16 will never learn Confusion. The southern gate to Saffron City is also blocked by a thirsty guard so don't bother with that for now. What you want to do is to go south to Vermilion City, going through Route 6 in the process. There are six trainers on Route 6, but you can avoid almost all of them. Meowths are similar to (but not quite as good as) Rattatas: speedy with lots of Normal-type attacking moves. But there's one twist: at level 17, Meowth learns Pay Day, while a weak attack, it pays you back money equal to double Meowth's level each time it's used. If you find yourself frequently short on cash, it could come in handy. Meowth's evolved form Persian is a common competitive choice as it has a nice speed for sweeping, so you may want to raise one. It has little use in-game, however. This page was last edited on 7 March 2016, at 19:57. This page has been accessed 868,113 times.